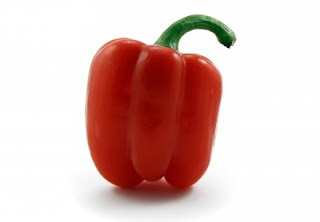 Red peppers have just over 7 and half times more caroteniods as green peppers! The public health message has moved from 5+ a day, to 5+ a day with a range of colors (as an aside it should be 6+ a day of vege and 3+ a day of fruit, with 15-20 different food groups and peppers are technically a fruit not a vege!). Anyway I expected red peppers to be more nutritious than green peppers. This is because we eat a lot of green vegetables already and less red vegetables so moving from green peppers to red peppers would be a good step. However I didn't expect red peppers to have 7.5 times caroteniods as green ones. This is a staggering increase. Not only is there an increase in caroteniods, there is an increase in the types of caroteniods. Beta-carotene increases "only" 5 times. There is at least 5 more additional caroteniods in the red peppers than the green peppers. 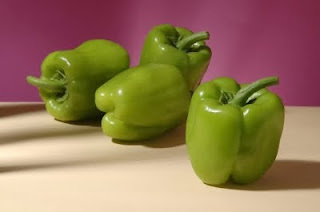 Now there is a drop in the lutein levels which make up 35% of the green pepper caroteniods. So if you are after lutein then eat the green ones. However I will be going for the red peppers as they have so much higher carotenoid levels, and many more types, thus are much more nutritious. Now for the shocker: When do you think this article was written? It seems very topical and a rather important piece of information. I know that it will affect both when I pick my peppers and what I purchase. If I was a grower I would be putting a premium on red pepper and selling them as highly nutritious. Ready for the date? ....... drum roll please...... 1978 ! Yes folks this research is 30 years old and the odds are that you have never heard this. There is so much life changing research out there that is lot in the mists of time. Reference: Camaraa and Monégera Free and esterified carotenoids in green and red fruits of Capsicum annuum. Phytochemistry. Volume 17, Issue 1, 1978, Pages 91-93.